Information (data) on tasks created via CAD can be re-used. The newly created data forms the basis for new programming. Enter weld length and welding conditions. Compiling data is the first step to retrieving data and re-using it. Prepared / compiled data is given a new name and saved. Newly saved data is checked by PC. At this time, the data is inspected for bugs, interference, etc. The completed data is sent to the controller for testing on real equipment. Once operations are checked with real equipment and no problems are found, the data is applied to real operations. Data is derived by CAD and re-used in data compilation for new tasks. We employ software that converts and reads converted 3-dimensional CAD data (STL format) (optional). Use of past items shortens the time required to produce data. 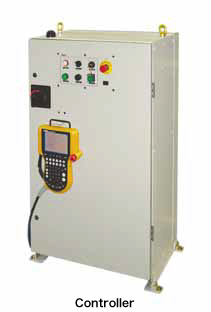 To create new data starting from zero, data on weld length and welding conditions are both entered. The process of retrieving or re-using data begins with data compilation. New data or data updated in the compilation process is given a new name and saved under that new name. Newly saved data is checked by PC. Newly saved data must be checked to ensure that it runs as expected. This checking process can be done with this software on a PC. At this time, the data is inspected for bugs, interference, etc. 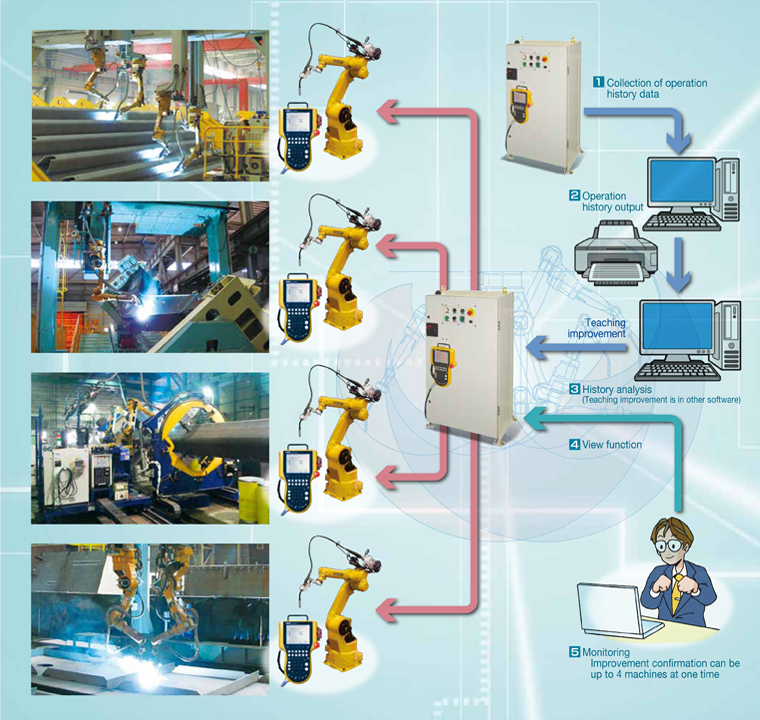 This software an detect any problems that may occur during real operations, including bugs, failure of weld torch, robot arm problems, etc. Bugs and failure problems can be detected on the PC screen, improving quality of the data by correcting as necessary. Where completed data that has been confirmed bug-free is saved, it is sent to the controller. It is then tested on real equipment(ARCMANTM). (When the data is sent, it is converted for use in a program to operate ARCMANTM). If there are no problems with use of the data on real equipment, the program name is specified and the data is applied to real operations. ARCMANTM operation history is automatically saved to the controller. This software automatically retrieves the data. From this data, this software creates monthly reports of operational performance, incorporating tabularization and graphs. This data can divided by manipulator, task, etc., as well as by specified period such as day, week, or month. The data contains information including instructions, any issues, operations performed to address said issues, and more. This software facilitates analysis, contributing to improved productivity. The software contributes to the improvement process. It can monitor multiple ARCMANTMs at once. ARCMANTM operation history is automatically saved to the controller. Operational records of ARCMANTM are constantly saved automatically. However, if capacity is exceeded, data is over-written and saved. This software automatically retrieves the data. Where this software is downloaded on PCs linked to controllers, this data is automatically retrieved from ARCMANTM. This software creates monthly operation performance reports from the data received at the beginning of each month. The reports include tabularization, graphs, etc., to help clarify operational circumstances and any issues on a monthly basis. The monthly report provides a benchmark. This data can be divided by the customer by manipulator, task, etc., as well as by specified period such as day, week, or month. Retrieved data contains all information including instructions, tracked changes, any issues, operations performed to address said issues, and more. This software records and stores operation history information, helping the customer to perform their own analysis. This facilitates better productivity of ARCMANTM. PCs equipped with this software are capable of live operation monitoring through networks, regardless of distance. Where the software does not operate properly due to problems with security software, please stop operations or delete. Two or more (When using the View function, use one additional ) LAN exclusively for this purpose. Microsoft Excel and a robot LAN manufactured by our company are required. In general, instructions on operations and other training on this software are held at our Fujisawa location. Robot operations require safety and robot operations training as specified under the law. Prior to taking this software operations course, you must first take safety training as well as ARCMANTM training. Day 1 AM Flow of operations / basic mouse operations / view operations / parts model compilation Trainees learn flow of operations of this software for standard layouts, and basic operations. In general, operations training for this software is held on customer premises. Understanding of basic Microsoft Windows operations is a prerequisite. Approximately one hour Operations are explained using the software manual.